I first came across Narihiro Nakamura’s name while researching an article about garbage collection I wrote back in March. He had just committed a large code change to the upcoming MRI Ruby 2.0 release enabling a new garbage collection technique called “bitmap marking,” which promises to speed up your apps by improving the way Ruby processes work with shared memory. Later I watched a video of a great presentation Narihiro did at RubyConf Argentina 2011 called Parallel worlds of CRuby’s GC about a garbage collection technique called “parallel marking.” Then I noticed on his web site that Narihiro had committed various other GC related code changes to Ruby over the past few years. It was clear that garbage collection has been an ongoing passion for Narihiro – a passion that benefits all of us! This month I decided to interview Narihiro for RubySource – I was curious to learn more about him and his work. 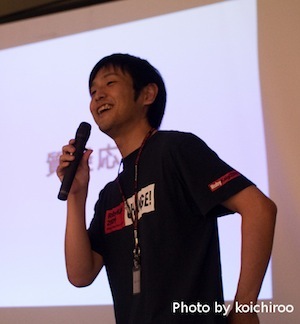 Because of the language barrier we conversed via email, unlike my other RubySource interviews, but I’ve included his original Japanese answers here for those of you who understand Japanese. Read on to learn more about Narihiro, and to get a sense of all the improvements Narihiro and the core team have made to GC over the past few years. Q: Hi Narihiro, thanks so much for your time. How are you? Hi – no problem at all… I’m doing great! The RubyWorld conference in Shimane Prefecture, Japan, is scheduled for November 8-9. Q: Can you tell us a little about yourself? Where you are from? Where do you work? What are you interested in beyond Ruby? I currently live in the Shimane Prefecture, Japan. Oh, by the way, the RubyWorld conference will be held here on November 8-9. We hope all of you can come and join us! I work at NaCl (Network Applied Communication Laboratory Ltd.). Six Ruby core committers work here, including Yukihiro Matsumoto. Umm… beyond Ruby? Well, I’m really interested in garbage collection. And, of course, I also like Ruby because it has its own garbage collector. Q: Who are the other 5 Ruby committers at NaCl? Q: How did you first get involved with Ruby? I first got involved with Ruby about five years ago when I came across some articles on the web about Ruby. I was also inspired by Kakutani Shintaro’s From Java to Ruby talk – it made me believe that Ruby was here to stay. Then I started coding in Ruby as a hobby. Q: How did you decide to work on garbage collection? The Ruby Hacking Guide, my favorite book, states that one of Ruby’s weak points is GC performance. When I read this I thought: “Maybe I can take care of that.” Since I’ve never been formally educated in garbage collection algorithms, I had to learn about it on my own. Now I want to apply what I’ve learned to improve MRI’s garbage collector. Q: What is it like working with the Ruby core team? The members of the Ruby core team are all very unique and cool people. I respect them and I’m really honored to work with them. Q: Can you think of a funny or interesting story about working with the core team that readers would enjoy? Oh, please see the joke category of Ruby’s Redmine. I highly recommend “Compress a sequence of ends”. Why learn about garbage collection? Q: At first glance, GC seems like a boring topic. Why should the rest of us be interested in it? The purpose of garbage collection is to free up unused memory segments. This seems to be a very easy and straightforward task, but actually it’s very difficult. There is no perfect solution. But that’s what makes it interesting to me. Since most programmers like the challenge of difficult problems, they will certainly enjoy GC. Also, many GC algorithms were invented by legendary hackers: John McCarthy, Edsger Wybe Dijkstra, Donald Ervin Knuth, and of course our own “Matz.” GC has attracted the attention of even legendary hackers. One goal of garbage collection is to function properly even if people don’t pay any attention to it. If a developer thinks of garbage collection as “magic” and nothing bad happens, then it is working as intended – and the GC system’s author will be happy. However, in a practical application you sometimes need to worry about GC, for example when an application requires smooth execution without pauses. Q: What does “Mark and Sweep” mean? Before I explain Mark and Sweep (M&S), let me first explain a few basic GC concepts. A garbage collector’s basic task is to collect all dead objects. A dead object is an object that is never referenced by the program. M&S is one of many GC algorithms. All Mark and Sweep GC systems have two separate phases: the mark phase and the sweep phase. In the mark phase, the collector marks live objects objects that are still referenced by program code. In the sweep phase, it scans the entire heap and “sweeps” away “dead” (unmarked) objects. Q: How does the GC system know which objects are currently referenced by the program during the mark phase? The GC system can find live objects by traversing a set of pointers (e.g. to Ruby’s local variables, global variables, etc…) that directly reference objects in the program. Q: What does “Lazy Sweep” mean? How is it different from Mark and Sweep? Since traditional M&S GC systems execute mark and sweep in one single, atomic operation, the application will pause while garbage collection is in progress. In Lazy sweeping, sweeping is lazy. Each invocation of the object allocator sweeps Ruby’s heap until it finds one appropriate free object and then returns. This improves the response time of GC; i.e. the worst case running time of the garbage collector decreases. 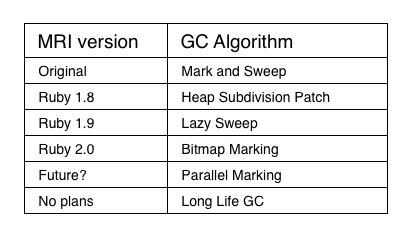 Q: But the Lazy Sweep GC algorithm still needs to mark all the objects? The mark phase is still the same? The only difference is that the sweep phase is faster? This is right. However, the throughput of the sweep phase doesn’t decrease, because Lazy Sweeping just amortizes the cost of sweeping by having the allocator perform the sweep. Q: What is the “Long Life GC” patch? The “Long Life GC” patch treats long-life objects as a special case. it’s similar to Generational GC. However, The patch is not in use in any current Ruby version. The Parallel Marking collector runs several marking processes in parallel by using native threads. This might improve your performance if you use a multi-core machine. This might sound easy, but is in fact a very difficult and complex process. What a fond memory! The “Heap Subdivision Patch” was my first contribution for MRI GC. In Ruby 1.8.x, when extending the heap we allocated a new contiguous memory block of 1.8 times the size of the old heap. In this approach, we couldn’t free up a large block if it had even one live object. My “Heap Subdivision Patch” divides the contiguous block into sub-blocks. This patch increases chances of freeing dead sub-blocks, which again improves GC performance. In Bitmap Marking, the “live object” flags are stored in a separate bitmap table, instead of in each objects header. Oh, I think your article is the best source of information for this topic! Q: Thanks Narihiro! Are there any other GC innovations you want to mention? Recently, I have been looking into the G1GC garbage collection algorithm used in OpenJDK7. This can control the maximum pause time of GC operations. Also, I have an interest in C4 by Azule. This algorithm achieve pauseless garbage collection by utilizing special CPU instructions. It’s fun! Q: What is coming next for Ruby GC? First, I plan to introduce several small fixes to M&S – for example, non-recursive marking, and a prefetching marking loop. And I’d like to refactor gc.c to make it easy to implement small fixes like these. Then, I plan to implement the parallel marking patch that I mentioned previously. Q: Can MRI Ruby learn anything from JRuby, Rubinius or other versions of Ruby? JRuby uses the JVM’s GC. I envy it :) And whenever I read Rubinius’s GC source code, I’m always surprised how beautiful the code is. I think MRI’s garbage collector lags behind a bit when compared to other GC implementations. For historical reasons, most of which relate to Ruby’s C extensions, it is hard to change this situation substantially. However, I hope to do something about this. Q: What else are you working on that you’d to tell everyone about? I recently wrote a book! Dissecting G1GC’s implementation …sorry, it’s only in Japanese. 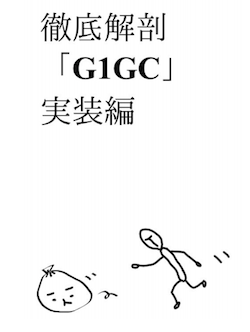 Narihiro’s new book describes the implementation of the G1GC algorithm in OpenJDK7. I have no specific plans… but I want to continue improving Ruby’s GC algorithm little by little. I’d like to acknowledge my colleague Mr. Tor, who helped me translate these answers into in English. Thanks! Pat Shaughnessy writes a blog about Ruby development and recently self-published an eBook called Ruby Under a Microscope. When he's not at the keyboard, Pat enjoys spending time with his wife and two kids. Pat is also a fluent Spanish speaker and travels frequently to Spain to visit his wife's family.